Sparks, Maryland – Campbell®, a premier brand of chain and fittings from Apex Tool Group, today announced its new improved Grade 100 Alloy Sling Hooks. 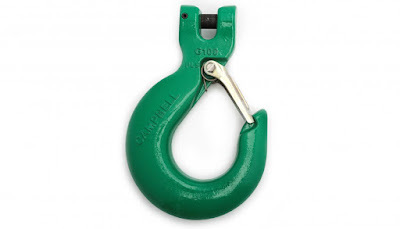 The new green-painted hooks are available in both clevis and eye styles and are made for use with Grade 80 and Grade 100 chain slings. Latched models feature a new heavy-duty latch and spring assembly.